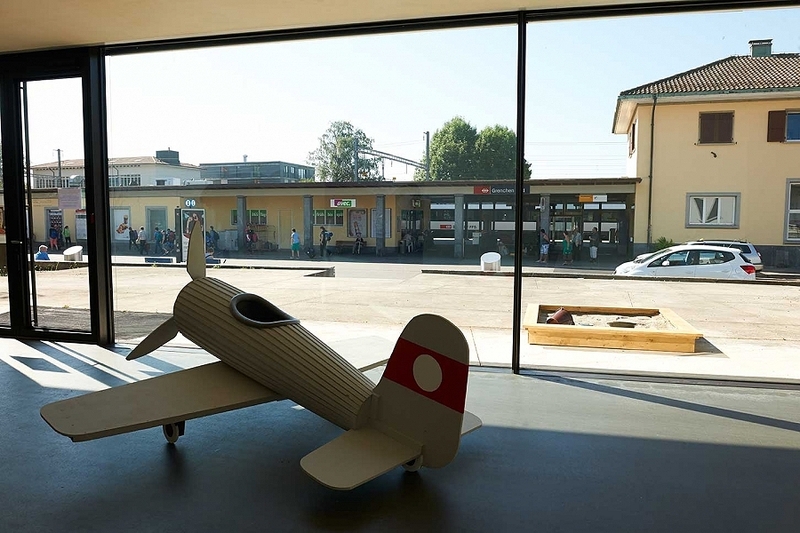 For the duration of the exhibition a small playground is installed in the foyer and the forecourt of the Kunsthaus: a wooden plane and a sand box await children to avail of them. What at first glance appears to be a ‘harmless’ opportunity for play gains more potential meaning inside the Kunsthaus. The plane’s form might be a cause of irritation, reminiscent as it is of early plane models, or its grey colour with the red and white painted tail, or the few sand pit tools, also anachronistic. Presented in the context of a Kunsthaus, the objects’ status oscillates between being everyday things and artworks, though the decisive indication of their meaning comes from the work’s title: Der Garten der Villa Höß (The Garden of the Villa Höß). With it, Sebastian Utzni is making reference to Rudolf Franz Ferdinand Höß’s villa. Höß was camp commander of the Auschwitz-Birkenau concentration camp during WWII. Directly neighbouring the camp, the dwelling, as photographs prove, offered his children a generous garden with a playground (and aeroplane, car, sand pit and a swimming pool with a slide). The garden idyll and children’s peaceable playing encounters the brutality of the home owner’s actions. By recreating the playthings, the artist shows us real objects that activate our memory through superficial properties and titles. Here the process of memory works in two ways: the viewer may first be reminded of their own childhood or of their (grand-) children at play, yet a viewer with an interest in history will also be reminded, by the title, of historic events. What also comes into question is the thin line – or the intertwined coexistence of memory and forgetting. Who remembers what? Thanks to the work’s presence both inside and outside the Kunsthaus we are given repeated prompts to reflect on guilt and innocence, knowledge and conscience, the contemporaneousness of the idyllic and the horrific, and remembering and forgetting. Photos © by Alexandra Roth.